Seth Meyers set just the right tone with a fantastic opening monologue and then got out of the way to let women tell their stories. Before Seth Meyers set foot in the Beverly Hilton Hotel Sunday night, he was already in a hole. As a man hosting a Golden Globes ceremony that was rightfully being driven by women’s stories, the question on the tip of everyone’s tongue was why a woman wasn’t running point at HFPA’s 75th celebration. And to be clear, there’s not a good reason one wasn’t. Aside from picking past hosts like Amy Poehler & Tina Fey, Janine Turner, or… well, that’s it (the Globes didn’t use a host regularly until 2010), there are a slew of incredible comedians who would’ve absolutely killed it this year. We would’ve loved to see that show. Really, it would’ve been incredible — but the show we got wasn’t Meyers’ to claim. He delivered a damn fine and exceptionally funny performance under raw, delicate conditions, but this was Oprah’s Golden Globes, and no one was going to take it away from her and the women she championed. At first, it felt like every joke from Meyers’ opening monologue would be topical — either circling Hollywood’s anti-harassment movement or poking at a president who was probably watching from bed. Opening the night with, “Good evening ladies and remaining gentlemen,” Meyer set a boundary-pushing tone he stuck to throughout the introduction. He directly confronted “the elephant not in the room” in such a way that eliminated the awkwardness, but not the sharp edges to his shrewd commentary. He even went so far as to joke about booing a dead man at a future in memoriam segment, which, it turns out, won’t earn laughs even if said dead guy is Harvey Weinstein. His resiliency paid off. Meyers knows how to set up his jokes in the short- and long-term, and his onslaught of uncomfortable, balloon-popping jabs led to an above-average number of literal laugh-out-loud moments. Sure, that dedication to relevant issues also softened some already soft jokes — like ’70s New York being so seedy it had two James Francos — but it didn’t dull the good, off-topic ones, like his bit where a presenter came out with an armful of awards for “The Post.” From Weinstein, to Kevin Spacey, to Woody Allen, no one was off the table, which made the “Jokes Seth Can’t Tell” portion of the evening even better. Going to Chastain first set a high bar, but ending on Poehler — whose relaxed demeanor, on the verge of laughter but with a punctuating bite on each sentence, elevated the moment immensely — put a beautiful bow on the fire-setting part of the monologue. Taking Meyers as my lead, I’m not going to explain why each section of the Seth-and-Amy back-and-forth was as hilarious as it was honed, but I encourage everyone to look back on the moment from the start to fully appreciate how layered it was. That kind of close set up an evening that felt like more women were speaking than men, even though there were as many Best Actor winners as Best Actress. 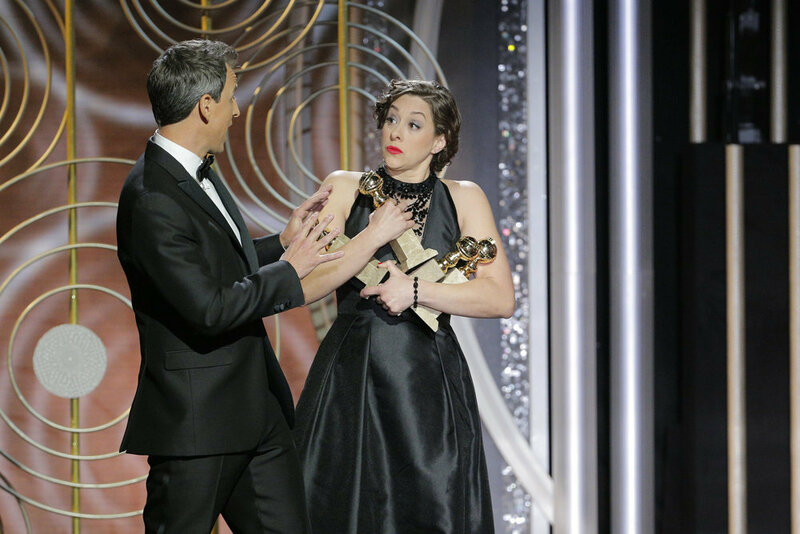 Because of how many awards it gives out (25 vs. 24 at the Oscars) and its dedication to letting the winners speak (they’re all usually pretty famous, after all), the Golden Globes always feel like a tight, award-after-award, speech-after-speech sprint. That doesn’t mean it doesn’t drag, it just means the rest of the show is less reliant on the host. Meyers popped up from time to time to introduce a new presenter, but he left his mark at the beginning and then got the hell out of the way. The winners, in large part, did not disappoint. Nicole Kidman made the most of her status to milk every bonus second she got on stage, thanking her “mama” for being an advocate for women and encouraging the industry to keep embracing change. Elisabeth Moss penned a sweet thank you to Margaret Atwood. Rachel Brosnahan said hi to Oprah and urged everyone to hold each other accountable. Oprah did what Oprah does best: She told a powerful story (of Recy Taylor) and inspired the audience in the auditorium and watching at home. But more than that, she embraced her role as a leader. Woe be to anyone who didn’t get chills when she said, “Their time is up.” The audience rose to their feet and the world did, too, in a show of enthusiasm few others can evoke. The women were magnificent Sunday night, and at least one man was phenomenal; let them set the tone for the future of Oprah’s vision.